A good Pie Crust should be flakey and, in my opinion, flavorful, which is why I prefer using Butter rather than Shortening. In fact, a straight forward Pate Brisee works perfectly well. In terms of quantity, a double recipe is more than sufficient. It provides enough Pastry Dough for a bottom Pie Crust, a top Lattice Crust, and sufficient scraps to make decorative pieces. Start by making a double recipe of Pate Brisee, splitting the Pastry Dough into two equal portions. Wrap the Pastry Dough in plastic wrap and allow it to rest and chill in the refrigerator for at least one hour. 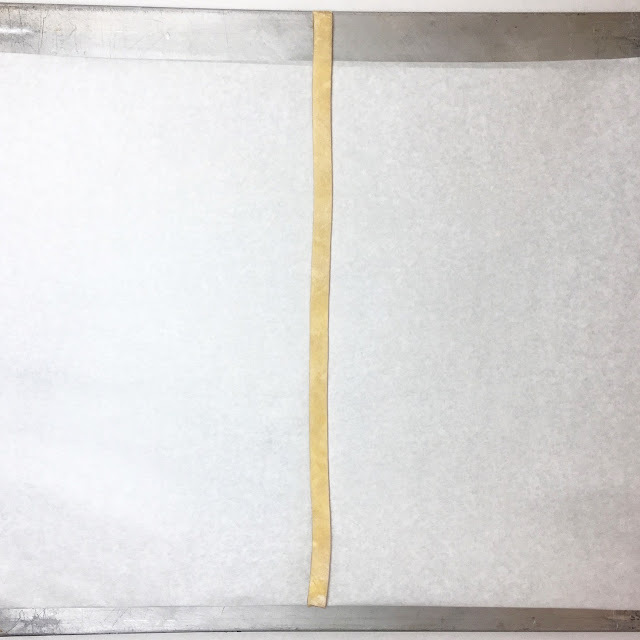 Once the Pastry Dough has rested, roll out each portion to the size of a half sheet tray (18" x 13") and approximately 1/4" thickness. Wrap the sheet trays in plastic wrap. Rest and chill the Pastry Dough in the refrigerator for at least 30 minutes. My biggest piece of advice while making a Lattice Crust is to repeatedly rest and chill the Pastry Dough. Resting the Pastry Dough relaxes gluten that may have developed during the mixing and rolling process, resulting in a more flakey and tender final Pie Crust. Chilling the Pastry Dough makes it easier to work with when molding the Pie Crust and weaving the Lattice Crust. Once the sheeted Pastry Dough has rested, remove one tray from the refrigerator. Cut the sheet of Pastry Dough into a circle approximately 13" in diameter. Save the scraps of Pastry Dough for making decorations, storing them well-wrapped in the refrigerator until you are ready to use them. Mold the bottom Pie Crust in a 10" deep dish pie plate. Do not trim any excess Pastry Dough at the edges of the pie plate at this time. Wrap the molded pie plate in plastic wrap and place it in the refrigerator to chill as you continue working. Now the real work begins - turning the remaining Pate Brisee into an intricately woven fabric of Pastry Dough. Step one: cutting many, many, many strips of Pastry Dough. Remove the second sheet of Pastry Dough from the refrigerator. Using a sharp paring knife or wheel cutter, cut the Pastry Dough into 13" long strips no thinner than 1/4" wide. The thinner you cut the strips of Pastry Dough, the more intricate the Lattice Crust will appear. However, thinner strips are also more delicate, harder to handle, and require more time to weave into a Lattice Crust. It is also possible to cut strips of varying widths to create a more varied Lattice Crust. Carefully place the cut strips of Pastry Dough on a separate parchment lined sheet tray. If the Pastry Dough becomes warm and soft while you are cutting strips, return the sheet tray to the refrigerator for 10-15 minutes before proceeding. When you have finished cutting the strips of Pastry Dough for the Lattice Crust, place the sheet tray in the refrigerator to chill for at least 15 minutes. Once the strips of Pastry Dough have chilled, begin to form the Lattice Crust. Start by laying one strip of Pastry Dough vertically on a parchment lined sheet tray. 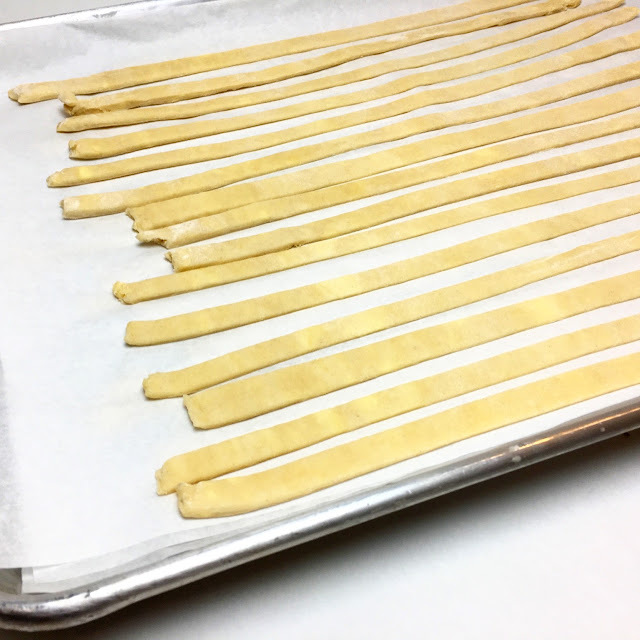 Next, starting at the top of the vertical strip, place a strip of Pastry Dough horizontally on top of the vertical strip (the vertical strip should touch at the center of the horizontal strip). Next, place a second horizontal strip immediately below the first horizontal strip, this time placing the horizontal strip underneath the vertical strip. Continue laying horizontal strips of Pastry Dough down the length of the vertical strip, alternating laying the strips on top of and underneath the vertical strip, until you reach the bottom of the vertical strip. 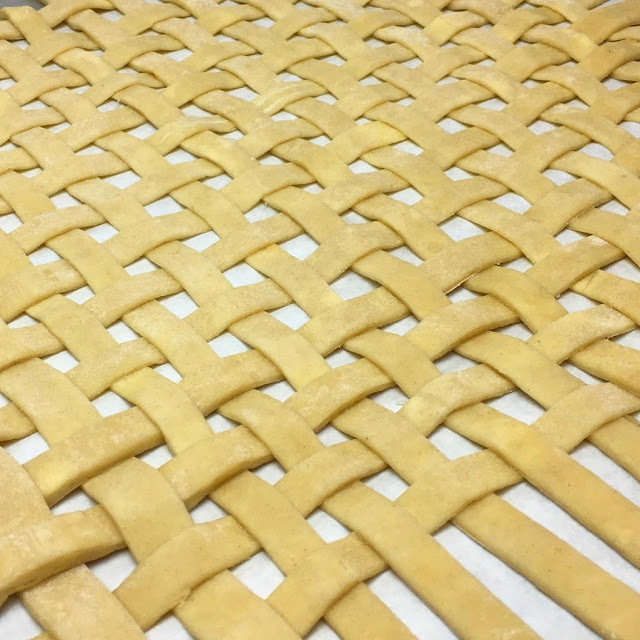 The strips of Pastry Dough can be arranged so that they are perfectly touching, resulting in a closed-lattice design, or some space can be left between strips. Once all of the horizontal pieces have been placed, carefully pull back each of the even numbered horizontal strips of Pastry Dough (counting from top to bottom) over the first vertical strip, pulling the strips over from right to left. With the even horizontal strips pulled back, place a second vertical strip of Pastry Dough to the right of the initial vertical strip. Carefully return the even numbered horizontal strips of Pastry Dough back to their original position. The second vertical strip should now be woven over and under the horizontal strips. Next, carefully pull back each of the odd numbered horizontal strips of Pastry Dough over both of the vertical strips. Place a third vertical strip of Pastry Dough to the right of the second vertical strip. Carefully return the odd numbered horizontal strips of Pastry Dough back to their original position. The third vertical strip should now be woven under and over the horizontal strips. Repeat the process, alternating raising the even and odd horizontal strips, until you have formed the Lattice Crust all the way to the right. You have now formed the right half of the Lattice Crust. Repeat the process with the same method starting to the left of the initial vertical piece, this time lifting the horizontal strips of Pastry Dough from left to right. Once the entire Lattice Crust has been formed, place it in the refrigerator to chill for at least 30 minutes. As the Lattice Crust chills, pre-heat the oven to 350 degrees Fahrenheit (177 degrees Celsius) and prepare the Apple Pie Filling. Wash, peel and core the Apples. Cube each Apple into ~1/2" sized pieces. To do this, you can cut each Apple in half, then cut each half into four wedges. Further cut each wedge into two or three pieces. As you work, place the cut pieces of Apple into a bowl of cold water to prevent browning. Once the Apples are cut, drain them from the cold water. 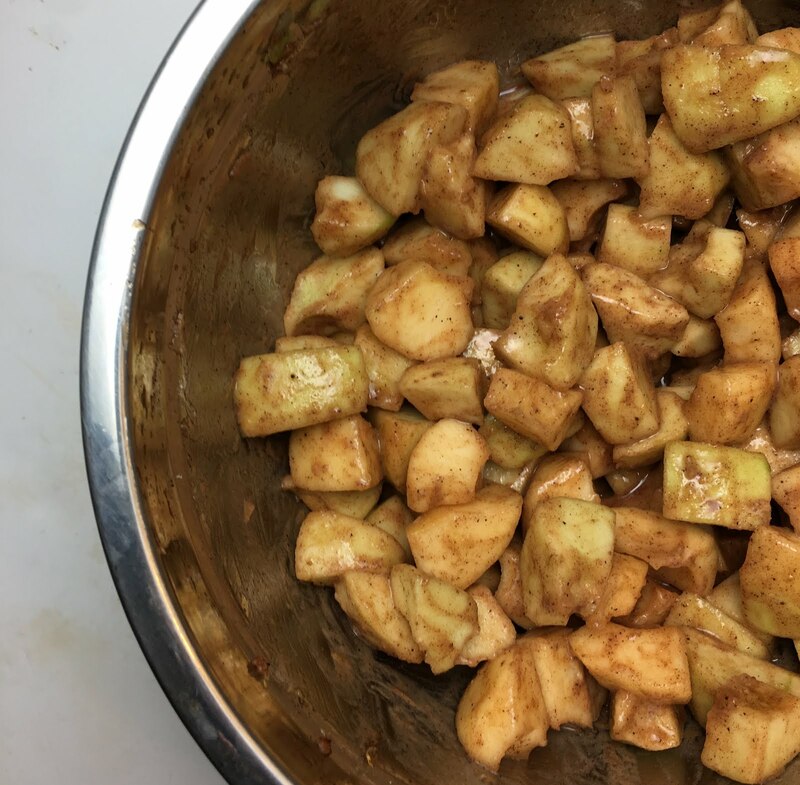 Combine the Apples with the Sugar, Honey, Lemon Zest, Lemon Juice, Corn Starch, Cinnamon, Nutmeg and Ginger. Gently toss the Apples until they are well coated in the other ingredients. Remove the pie plate from the refrigerator. Carefully spoon the Apple Pie Filling into the pie plate in a mound (the Apple Pie Filling will settle somewhat as the Apples soften). Remove the chilled Lattice Crust from the refrigerator. Lightly brush the edges of the bottom Pie Crust with Egg Wash or Water. 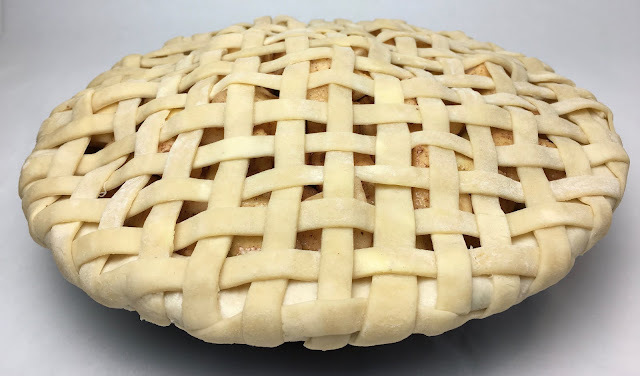 Carefully place the Lattice Crust on top of the filled pie plate. You may need to adjust some of the individual Pastry Dough strips once the Lattice Crust is placed on top of the pie plate. Firmly press the edges of pie plate to seal the bottom Pie Crust with the top Lattice Crust. Trim any excess Pastry Dough from the edges of the pie plate with a sharp paring knife. 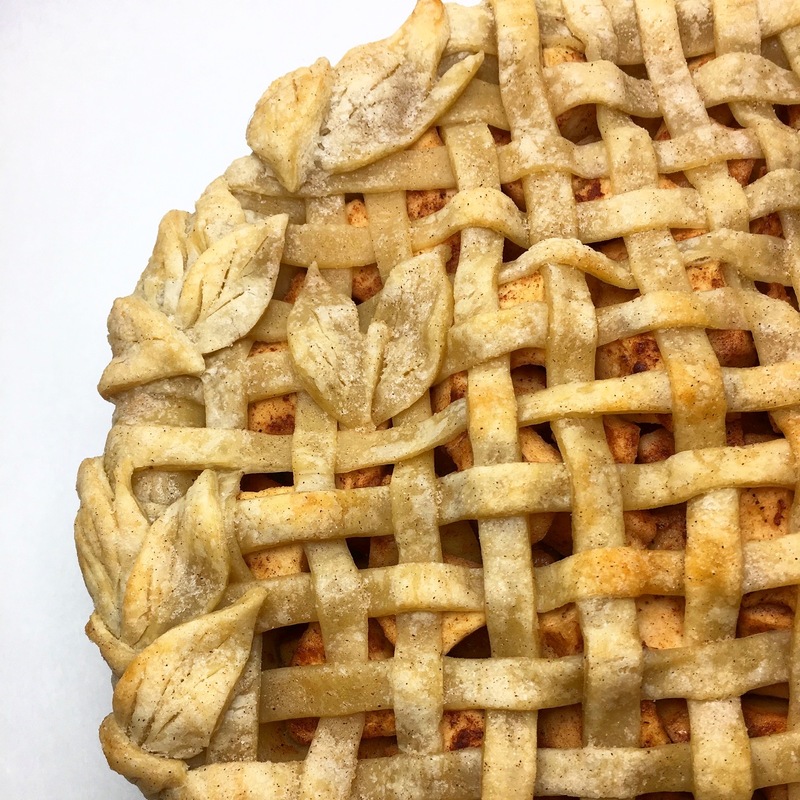 It is also possible to form the Lattice Crust directly on top of the Apple Pie Filling. Some may find this easier than transferring the formed Lattice Crust from a sheet tray to on top of the Apple Pie Filling. 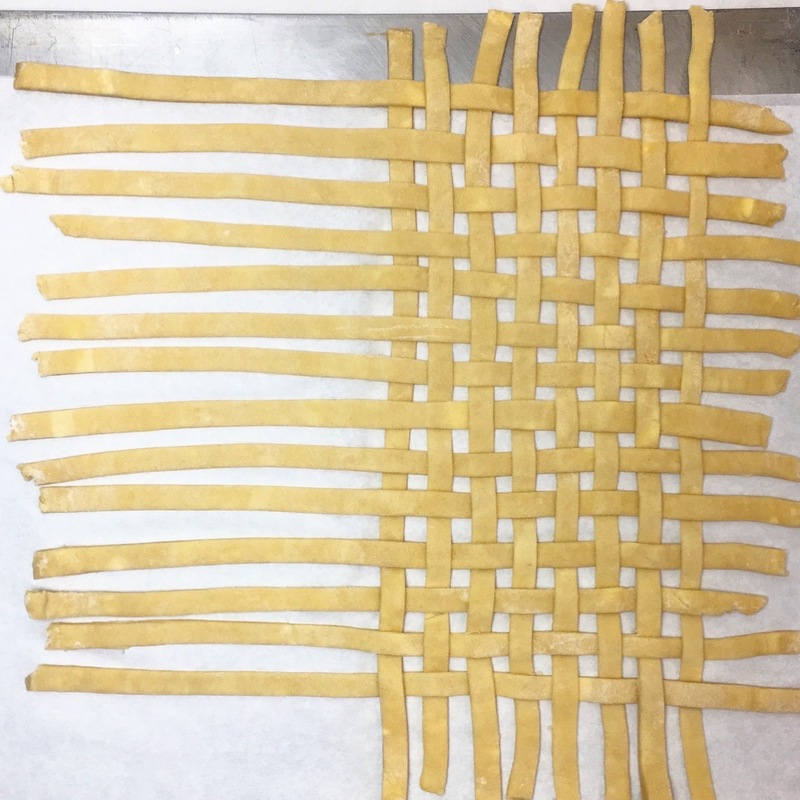 However, weaving the Lattice Crust on a sheet tray is often easier when first learning the process. If desired, use some of the excess Pastry Dough to form decorations (e.g. leaves, braids, cookie cutter shapes, etc.) When cutting decorative pieces, work with well-chilled Pastry Dough. Lightly brush the decorative pieces with Egg Wash or Water to attach them to the Lattice Crust. Lightly brush the Pastry Dough with Egg Wash or melted Butter and then dust the Pastry Dough with Cinnamon and Sugar. Bake the Apple Pie at 350 degrees Fahrenheit (177 degrees Celsius) for 60-75 minutes, or until the Apples have softened and the Pastry Dough is lightly browned and baked through. If the Pastry Dough begins to brown too quickly (particularly at the edges), it can be protected using pieces of aluminum foil. Allow the Apple Pie to cool for at least 30 minutes before cutting. The Apple Pie will keep well at room temperature for 2-3 days. The Apple Pie will keep for 4-5 days when wrapped loosely in plastic wrap in the refrigerator. 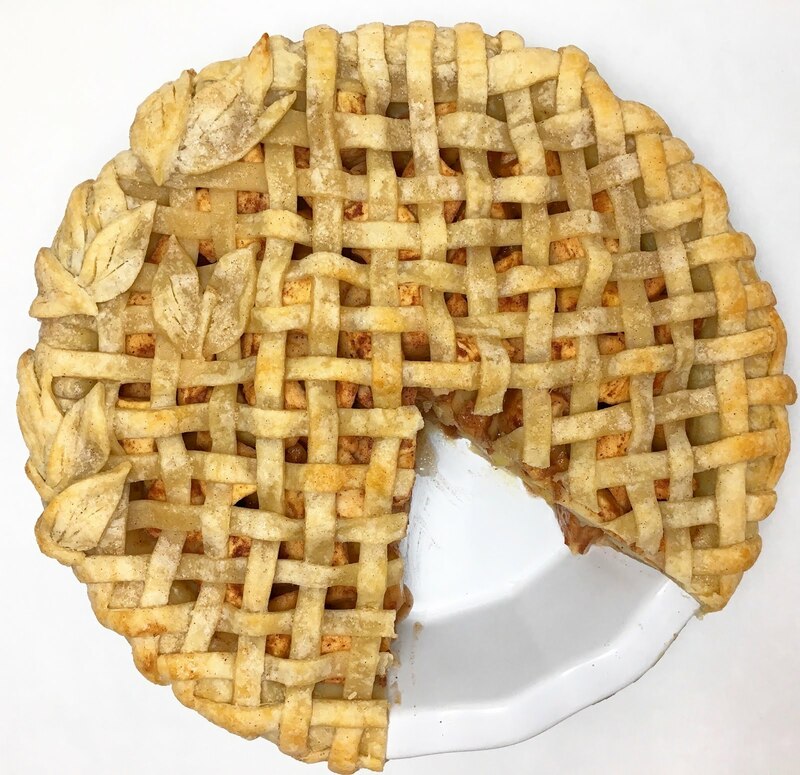 The Pie Crust may become soft if the Apple Pie is stored in a humid environment or in the refrigerator. The Apple Pie can be reheated, and the Pie Crust made crisper, in an oven for 7-10 minutes at 350 degrees Fahrenheit (177 degrees Celsius). *Note on ingredients: A double recipe of Pate Brisee will be more than enough Pastry Dough to form the bottom Pie Crust, top Lattice Crust and any additional decorative pieces you desire. 1. Prepare a double recipe of Pate Brisee, splitting the Pastry Dough into two equal portions. Wrap the Pastry Dough in plastic wrap and allow it to rest and chill in the refrigerator for at least one hour. 2. Once the Pastry Dough has rested, roll out each portion to the size of a half sheet tray (18" x 13") and approximately 1/4" thickness. Wrap the sheet trays in plastic wrap. Rest and chill the Pastry Dough in the refrigerator for at least 30 minutes. Chef's Note: Throughout this process, it is important to repeatedly rest and chill the Pastry Dough. Resting the Pastry Dough relaxes gluten that may have developed during the mixing and rolling process, resulting in a more flakey and tender final Pie Crust. Chilling the Pastry Dough makes it easier to work with when molding the Pie Crust and weaving the Lattice Crust. 3. Once the sheeted Pastry Dough has rested, remove one tray from the refrigerator. Cut the sheet of Pastry Dough into a circle approximately 13" in diameter. Save the scraps of Pastry Dough for making decorations, storing them well-wrapped in the refrigerator until you are ready to use them. 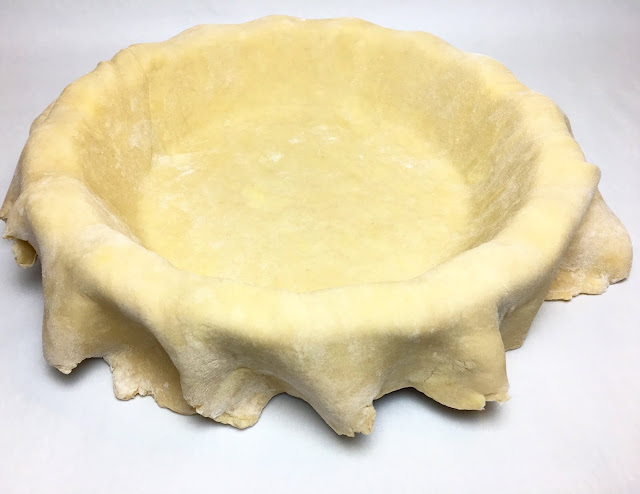 Mold the bottom Pie Crust in a 10" deep dish pie plate. Do not trim any excess Pastry Dough at the edges of the pie plate at this time. Wrap the molded pie plate in plastic wrap and place it in the refrigerator. 4. Remove the second sheet of Pastry Dough from the refrigerator. Using a sharp paring knife or wheel cutter, cut the Pastry Dough into 13" long strips no thinner than 1/4" wide. Carefully place the cut strips of Pastry Dough on a separate parchment lined sheet tray. If the Pastry Dough becomes warm and soft while you are cutting strips, return the sheet tray to the refrigerator for 10-15 minutes before proceeding. When you have finished cutting the strips of Pastry Dough for the Lattice Crust, place the sheet tray in the refrigerator to chill for at least 15 minutes. Chef's Note: The thinner you cut the strips of Pastry Dough, the more intricate the Lattice Crust will appear. However, thinner strips are also more delicate, harder to handle, and require more time to weave into a Lattice Crust. It is also possible to cut strips of varying widths to create a more varied Lattice Crust. 5. Once the strips of Pastry Dough have chilled, begin to form the Lattice Crust. Start by laying one strip of Pastry Dough vertically on a parchment lined sheet tray. 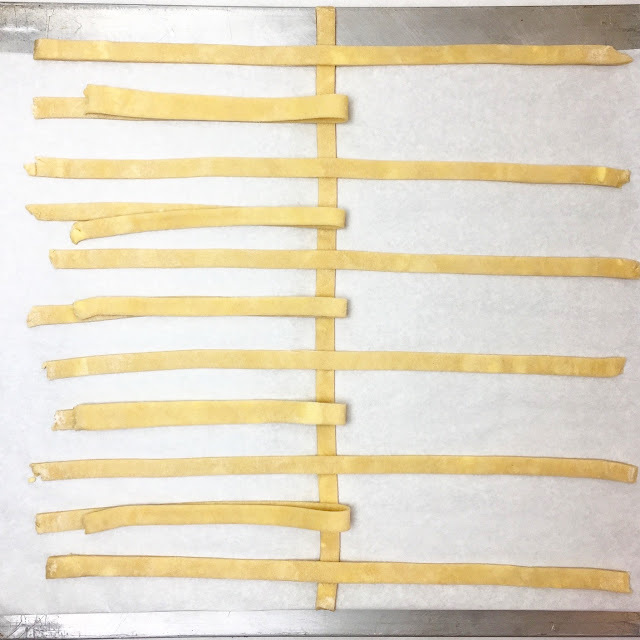 Next, starting at the top of the vertical strip, place a strip of Pastry Dough horizontally on top of the vertical strip (the vertical strip should touch at the center of the horizontal strip). Next, place a second horizontal strip immediately below the first horizontal strip, this time placing the horizontal strip underneath the vertical strip. 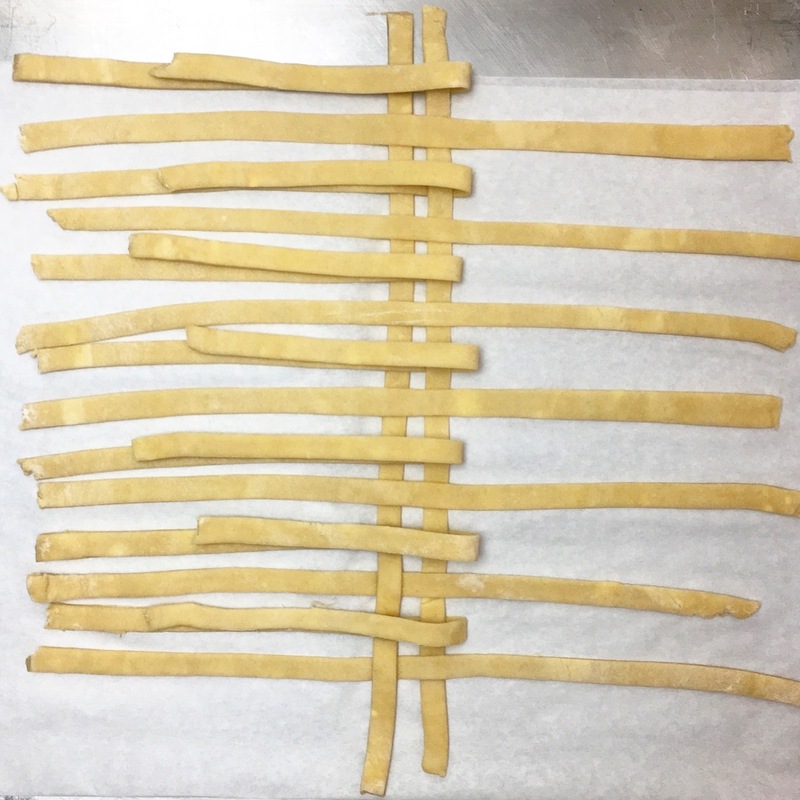 Continue laying horizontal strips of Pastry Dough down the length of the vertical strip, alternating laying the strips on top of and underneath the vertical strip, until you reach the bottom of the vertical strip. 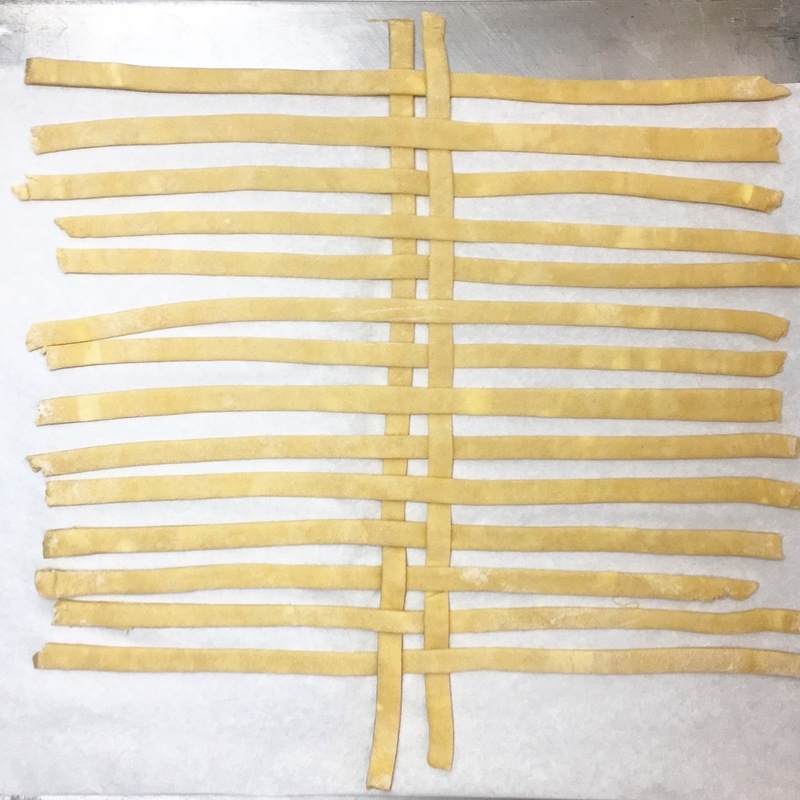 Chef's Note: The strips of Pastry Dough can be arranged so that they are perfectly touching, resulting in a closed lattice design, or some space can be left between strips. 6. Once all of the horizontal pieces have been placed, carefully pull back each of the even numbered horizontal strips of Pastry Dough (counting from top to bottom) over the first vertical strip, pulling the strips over from right to left. With the even horizontal strips pulled back, place a second vertical strip of Pastry Dough to the right of the initial vertical strip. Carefully return the even numbered horizontal strips of Pastry Dough back to their original position. The second vertical strip should now be woven over and under the horizontal strips. 7. Next, carefully pull back each of the odd numbered horizontal strips of Pastry Dough over both of the vertical strips. Place a third vertical strip of Pastry Dough to the right of the second vertical strip. Carefully return the odd numbered horizontal strips of Pastry Dough back to their original position. The third vertical strip should now be woven under and over the horizontal strips. 8. Repeat the process, alternating raising the even and odd horizontal strips, until you have formed the Lattice Crust all the way to the right. You have now formed the right half of the Lattice Crust. Repeat the process with the same method starting to the left of the initial vertical piece, this time lifting the horizontal strips of Pastry Dough from left to right. Once the entire Lattice Crust has been formed, place it in the refrigerator to chill for at least 30 minutes. 9. As the Lattice Crust chills, pre-heat the oven to 350 degrees Fahrenheit (177 degrees Celsius). 10. Prepare the Apple Pie Filling. 11. Once the Apples are cut, drain them from the cold water. Combine the Apples with the Sugar, Honey, Lemon Zest, Lemon Juice, Corn Starch, Cinnamon, Nutmeg and Ginger. Gently toss the Apples until they are well coated in the other ingredients. 12. Remove the pie plate from the refrigerator. Carefully spoon the Apple Pie Filling into the pie plate in a mound (the Apple Pie Filling will settle somewhat as it Apples soften). 13. Remove the chilled Lattice Crust from the refrigerator. Lightly brush the edges of the bottom Pie Crust with Egg Wash or Water. 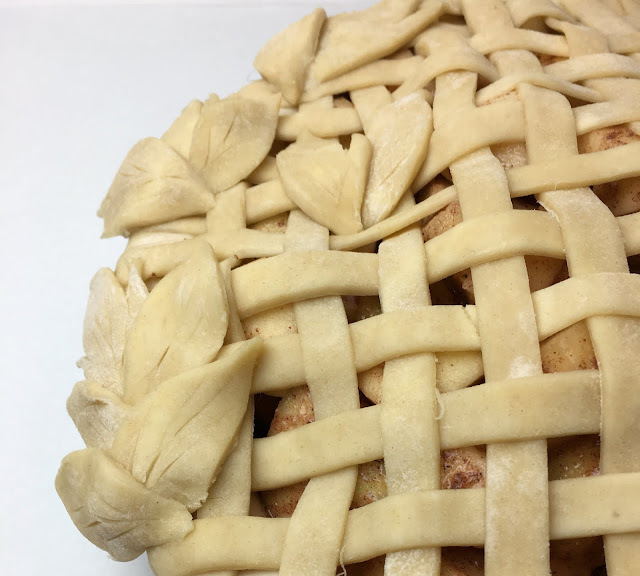 Carefully place the Lattice Crust on top of the filled pie plate. 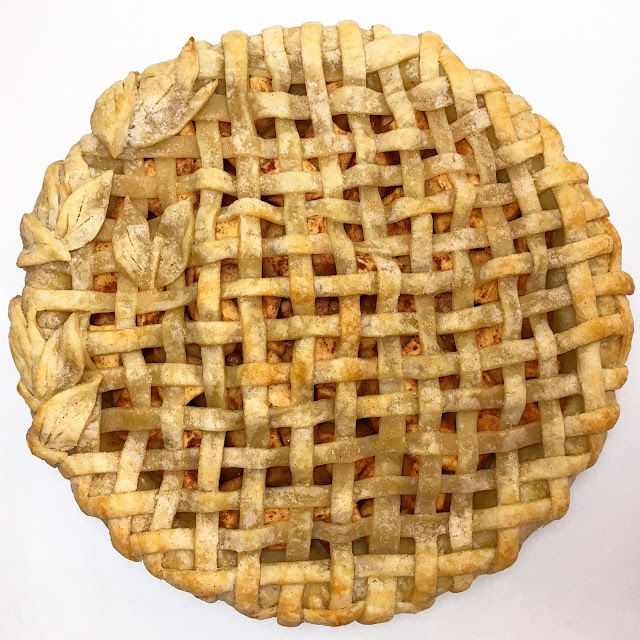 You may need to adjust some of the individual Pastry Dough strips once the Lattice Crust is placed on top of the pie plate. Firmly press the edges of pie plate to seal the bottom Pie Crust with the top Lattice Crust. Trim any excess Pastry Dough from the edges of the pie plate with a sharp paring knife. Chef's Note: It is also possible to form the Lattice Crust directly on top of the Apple Pie Filling. Some may find this easier than transferring the formed Lattice Crust from a sheet tray to on top of the Apple Pie Filling. However, weaving the Lattice Crust on a sheet tray is often easier when first learning the process. 14. If desired, use some of the excess Pastry Dough to form decorations (e.g. leaves, braids, cookie cutter shapes, etc.) When cutting decorative pieces, work with well-chilled Pastry Dough. Lightly brush the decorative pieces with Egg Wash or Water to attach them to the Lattice Crust. 15. Lightly brush the Pastry Dough with Egg Wash or melted Butter and then dust the Pastry Dough with Cinnamon and Sugar. 16. 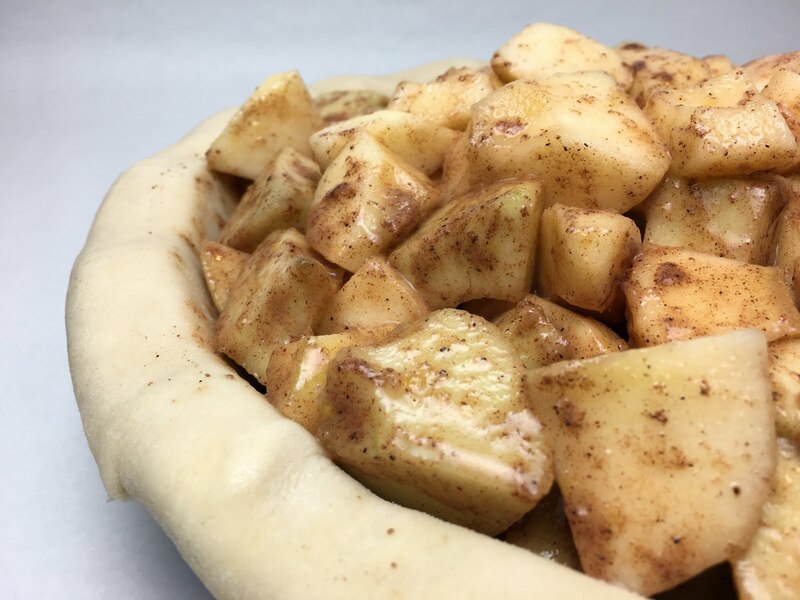 Bake the Apple Pie at 350 degrees Fahrenheit (177 degrees Celsius) for 60-75 minutes, or until the Apples have softened and the Pastry Dough is lightly browned and baked through. If the Pastry Dough begins to brown too quickly (particularly at the edges), it can be protected using pieces of aluminum foil. 17. Allow the Apple Pie to cool for at least 30 minutes before cutting. - The Apple Pie will keep well at room temperature for 2-3 days. The Apple Pie will keep for 4-5 days when wrapped loosely in plastic wrap in the refrigerator. 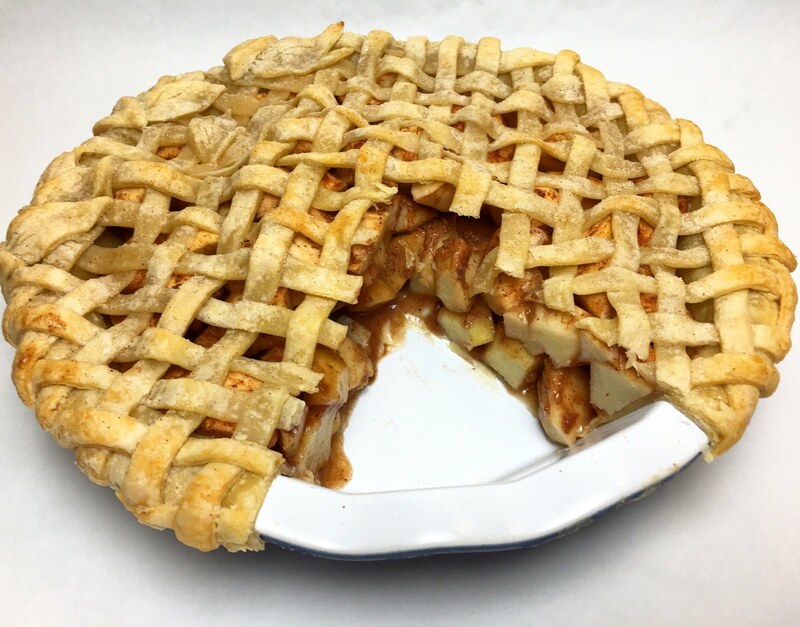 - The Pie Crust may become soft if the Apple Pie is stored in a humid environment or in the refrigerator. The Apple Pie can be reheated, and the Pie Crust made crisper, in an oven for 7-10 minutes at 350 degrees Fahrenheit (177 degrees Celsius). You can pick the best essay writer to form the internet but if you need to get the professional essay writer then it's not easy that you can get it easily. This kind of edubirdie priceslegit helps you to get the best essay writing professional who is able to write the best composition for you and this will become easy that you can e=get the best composition of any type of topic for your use.